There are 2 scents that are guaranteed to get my family out of bed on those lazy weekend mornings – the smell of bacon frying and the smell of cinnamon. The first one I try to avoid because it seems like every time I fry bacon, the smell lingers in the house for 2 days (and I am one of the few people who doesn't like bacon). I am slowly making more and more breakfasts in my crockpot. The first time I made crockpot steel cut oats with apples & cinnamon, it was an eye-opener (I love steel cut oats, but they are a complete pain to make in the morning). My crockpot French Toast is another favorite in this family. This recipe is wonderful, but since it is so sweet, I think we will save it for weekend breakfasts, just a few times per month. My dentist will thank me! I've made Monkey Bread in the oven many times and it is just fine, but I really think I like it more made in the crockpot. First of all, there is less of a chance of it bubbling up and over and making a mess in the bottom of my oven. And second – there is less chance of it burning or overcooking! Ok – one last thing before we get to making it…..you need to pretty much plan to serve this hot and as soon as it is done. If you need a little extra time to get everyone eating, leave the lid on your crockpot and set it to warm. If you let it cool down, it WILL get rock-hard and disgusting. 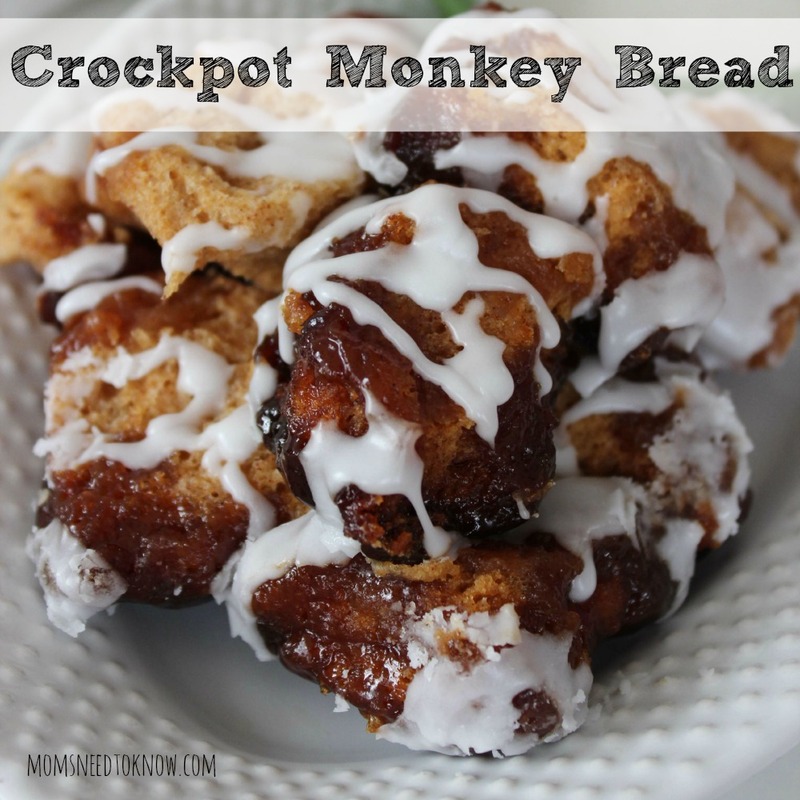 One MORE “last thing” – the glaze on it is entirely optional and not really “traditional” for Monkey Bread (then again – neither is making it in the crockpot! ), but my kids really do love it. Try it with and without the glaze and see which one you like best! Simply open your biscuits and cut each one in to bite-size pieces. If using homemade biscuit dough, just snip off a bunch of pieces from your dough ball) Use a little bit of the butter to brush the insides of your crockpot with butter. Place the melted butter in a bowl. Combine the cinnamon and sugar together in a separate bowl. 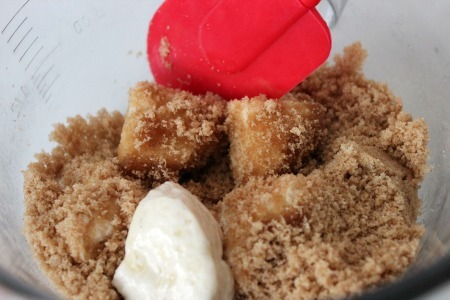 Dip the biscuit pieces first in the butter and then in the cinnamon sugar mixture, tossing to coat. Place the coated biscuit pieces in the bottom of the crockpot (you might have a few layers, depending on the size of your crockpot). Pour any leftover butter and cinnamon sugar over the top. Cook on High for 1.5 – 2 hours. 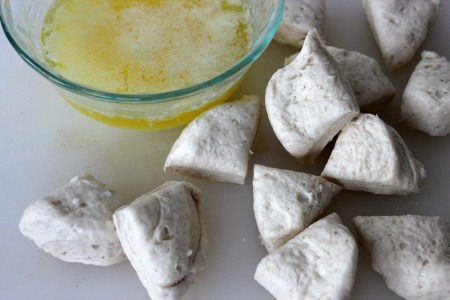 Allow to cool slightly and then whisk together the powdered sugar and milk and drizzle the glaze on top! 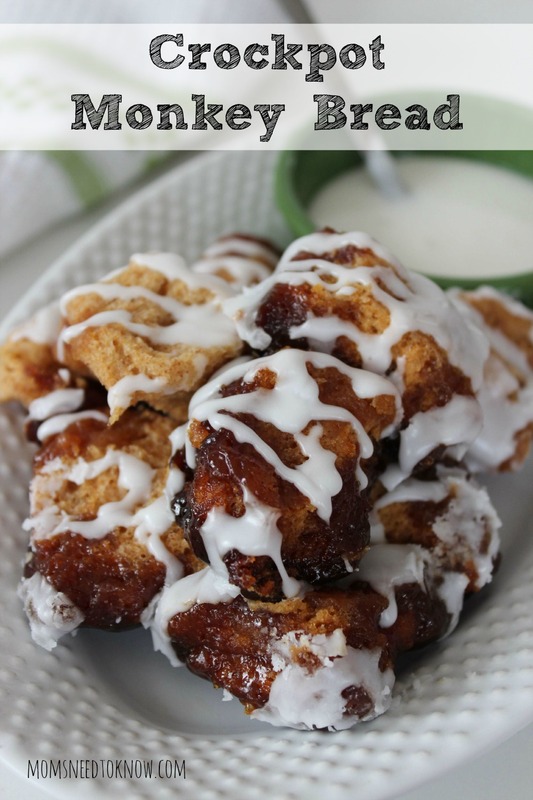 This easy to make Crockpot Cinnamon Monkey Bread is so comforting on a cold morning and sure to be a family favorite! 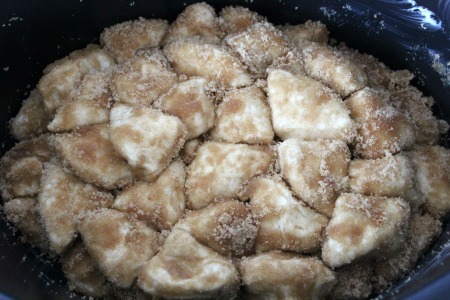 Place coated biscuit pieces in layers in the bottom of the crockpot. Cook on High for 1.5 – 2 hours. Seriously, it’s that easy!? Ok, I am definitely gonna make this next weekend!! Yum, I love monkey bread! I will be trying this out! Thanks for sharing at Merry Monday! Ooey gooey goodness lol. Can’t wait to try it. I think my children will love it.